People of Kaunas have a new subject for public debates – the growing prices of public transportation tickets. While paying more for the same service is never a pleasant change, the quality of it is about to increase dramatically. 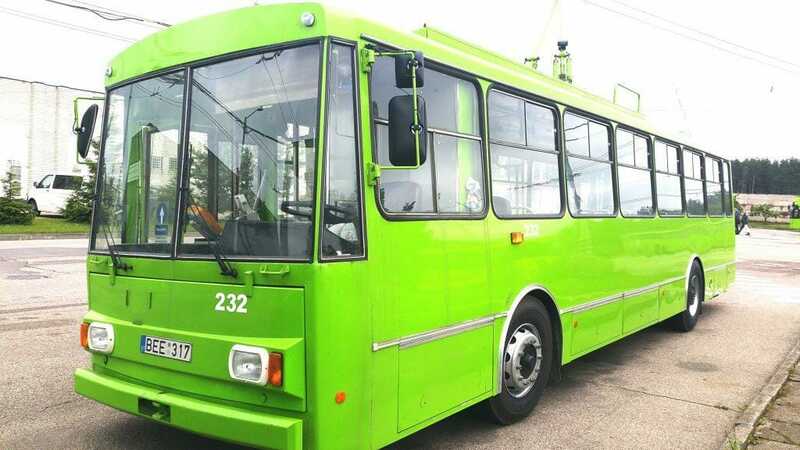 Kaunas is going to get rid of old Škoda 14Tr trolleybuses, which is absolutely necessary. Why? What is the Škoda 14Tr and why it has no place in a modern city? We talked about this with “Kauno Autubusai” – the company taking care of public transport in Kaunas. Kaunas, the second largest Lithuanian city, can be hardly imagined without its iconic trolleybuses. While there is nothing special or unique about public transportation in this city, trolleybuses specifically have a deep relation with Kaunas image. They have been around since 1965, when the first line was opened. Since then a lot has changed, including trolleybuses, and people grew to love them. Made in Czechoslovakia – nowadays this sign looks a bit funny. But it is a love-hate relationship, actually, because the majority of Kaunas trolleybuses are old and dreadful Škoda 14Tr vehicles. They are extremely noisy, very hot in summer and very cold in winter, have high floor and are very uncomfortable for the driver. All of this is about to change – Kaunas streets will be free from “Made in Czechoslovakia” trolleybuses in about two years. “Kauno Autobusai” is doing a great job maintaining the good condition of these trolleybuses, but they are just too old and troublesome. While brand new trolleybuses are good news for all regular users of public transport, it also means that ticket prices are increasing from 1st of August. Electronic tickets are going to cost 70 euro cents, instead of the current 58, and the paper ones you buy from the driver – 1 euro. People really disliked the change, but they will get better quality services for the money. 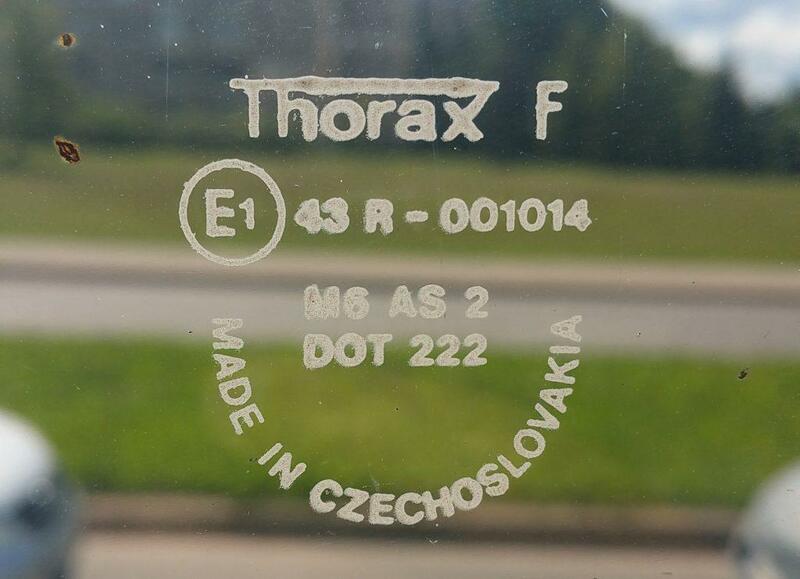 Not only Škoda 14Tr’s are making people laugh with their “Made in Czechoslovakia” signs on windows (despite most of them being made after the Czech Republic and Slovakia split apart), but they also torture passengers with heat, cold and sometimes water. They are technically and morally old and there is no way around it. “Kauno Autobusai” has 98 of them, their average age – 28 years. Together they covered more than 160 million kilometres and were rebuilt several times. While you can fix them up to keep them running safely, it is impossibe to introduce such things as low floor – which allows older people as well as parents with baby buggies and disabled people to get in easier -, more comfortable seating or air conditioning. The driver’s workplace is really uncomfortable. Škoda 14Tr trolleybuses had been manufactured since 1981, although first prototypes showed up in 1972-1974. The last trolleybuses of this model left the factory in 2004, although production was significantly reduced in 1998. In total, 3888 14Tr’s were made and delivered to various cities, mostly in Eastern Europe and Soviet Union. Currently, Kiev, Vilnius and Riga have the largest amount of these trolleybuses, but they are slowly moving away. Not only Škoda 14Tr trolleybuses are pretty dreadful to ride in, they are also extremely unreliable at this point. 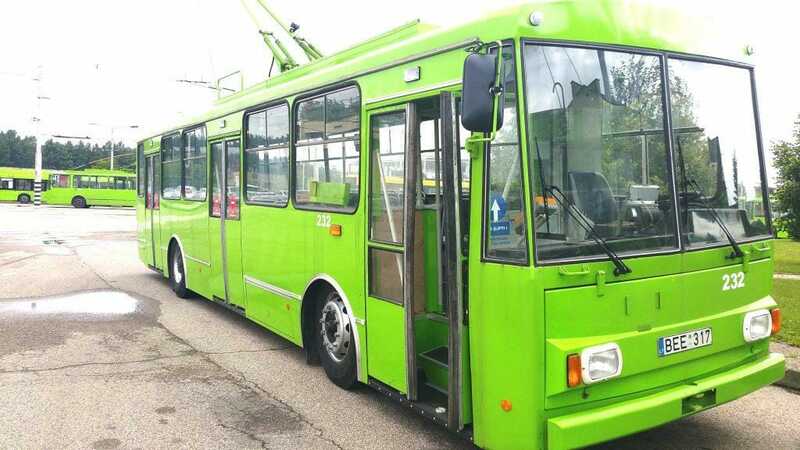 The problem is that all electric gubbins, including the motor, are placed underneath the floor of the trolleybus (that is why the floor is so high and you have to climb some steps to get in) and is not sealed in any way. Water gets in and damages these parts all the time and workers at “Kauno Autobusai” have to race against time every night to fix trolleybuses and make sure that in the morning a sufficient number of them will be running. 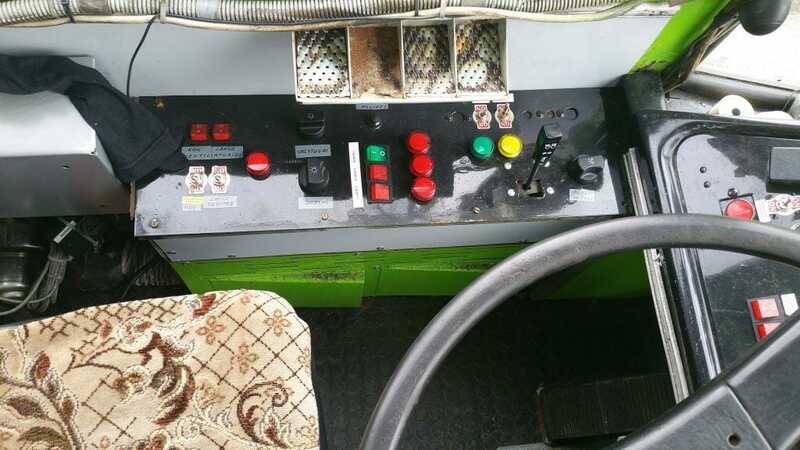 On this pannel you can find turn signals, lights, doors, heater and other controls. Škoda 14Tr has a 100 kW motor, which is enough to propel it to a speed of 65 km/h. It accelerates quite loudly, though, because gears in the final drive are basically worn out. The trollleybus has three sets of double doors, all opening to the inside. They are not very wide, which is not helping the already troubled ingress for some people. There are 29 seats and 71 people can travel standing, according to vehicle data. The driver’s cabin is really not that great either. The steering wheel is not adjustable in any way whatsoever, so it is difficult to get comfortable. Controls are laid out randomly, although drivers find everything just out of experience. Seats are uncomfortable and the lack of air conditioning means that “Kauno Autobusai” had to fit simple fans, usually hanging above the driver’s head. This is basically a key to the bus – a turn of this handle turns on power supply to the trolleybus, allowing it to start working. However, as unreliable and uncomfortable as Škoda 14Tr trolleybuses may be, “Kauno Autobusai” ensured us that they are completely safe to use. All of them have to go through thorough technical inspection twice a year and are maintained constantly. Every night workers fix minor defects and major repairs may take several days. “Kauno Autobusai” has a reserve of trolleybuses for such cases. So now you know that replacing all tired Škoda 14Tr trolleybuses is absolutely necessary. And that is why ticket prices are going to increase. At the moment, it is still not decided which trolleybuses Kaunas will have, but some information is already known. They are going to be about the same capacity, but they will feature low floor, air conditioning and some other comfort equipment. And, of course, they will be much less of a problem in repair shops. Saulius Alekna, the manager of the Kaunas’ trolleybus park, told us that in around two years Kaunas should have no Škoda 14Tr buses on the streets. All of them will be replaced with brand new units, but the manufacturer of them has not been decided yet. There is a contest under way and it is still not clear who will make the best offer. Alekna said that the company is looking forward to having electric buses as well, but only when the technology is cheaper, meaning that in the foreseeable future Kaunas will still be running trolleybuses. Think decades before they – and normal buses – are replaced with electric units. But trolleybuses are definitely good enough. The contact network is already in place and these vehicles are very eco-friendly. Kaunas’s trolleybus park consists of 155 trolleybuses, 98 of them are Škoda 14Tr; 42 – Solaris Trollino 12; 15 – articulated Berkhof trolleybuses. 311 drivers are driving them. Together, all these trolleybuses have covered more than 200 million kilometres in their lifetime, but 160 million of them belong to Škoda 14Tr. Every day, Škoda 14Tr trolleybuses cover 14 thousand kilometres in Kaunas. 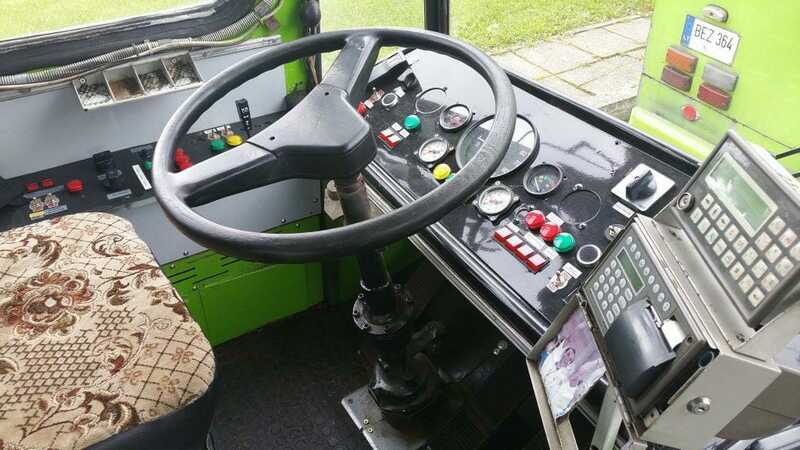 While new trolleybuses have only two pedals, Škoda 14Tr has three. Two of them are brakes: the central pedal engages electric brakes and the left one – pneumatic. Braking with the electric motor is useful when the trolleybus only needs to slow down a bit without coming to a complete stop. While it is obvious that Škoda 14Tr is not a modern vehicle, it still has 2 kilometres of cables. “Kauno Autobusai” found out about it by themselves while repairing these trolleybuses. In modern trolleybuses this number is several times larger. Not only Škoda 14Tr is an unreliable machine, it is also an easy target for pranksters who routinely pull contacts off the wires, immobilizing the trolleybus. It is easy to do so as the ropes holding contact poles are exposed. 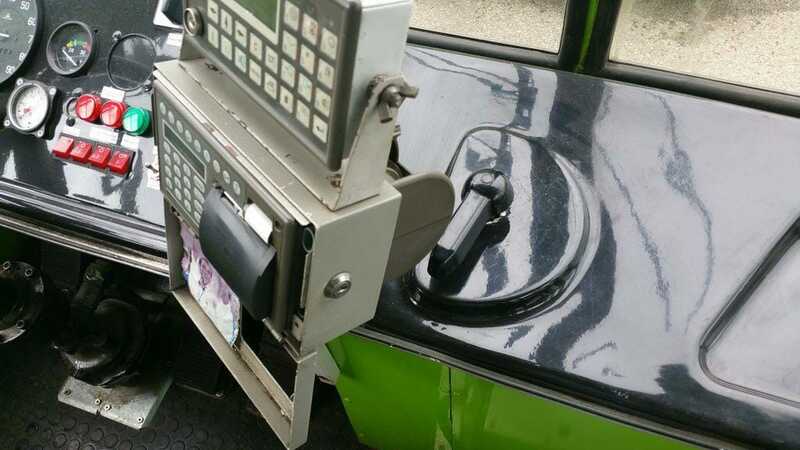 There is also a switch which can be easily deactivated from the outside, turning the trolleybus completely off. We were kindly asked not to show it to you. In Lithuanian, contact poles are called “trolleybus moustache”. How do trolleybuses know where to go when the lines split? There are two ways of dealing with this situation. In some spots there are switches that can connect to one or another line. There are blue arrow signs allowing the trolleybus drivers to know which one is engaged and they can change it with remote controllers. However, in not-so-modern splits, Škoda 14Tr trolleybuses have to use a different trick – when the trolleybus is coasting, it will always go left and, when it is accelerating, it will always go right. This is why it slows down so much in these splits or accelerates just before them. All trolleybuses in Kaunas, except two, are painted green. “Kauno Autobusai” had an idea of painting all of them red (and they did with these two), to match the red buses. But they changed their mind, because it just didn’t look right and people seem to love trolleybuses being green and buses red. The green colour also fits the green character of the vehicle. The number plates of most trolleybuses in Kaunas start with BEE, but it is just a coincidence. Most of them were registered at the same time, despite their different age. It is because some time ago trolleybuses didn’t need to have number plates at all – it is not like they can leave the city anyway. That’s a Škoda 9Tr, specifically modified to accomodate parties – you can book it and it will take you wherever you want. While Škoda 14Tr is by far the oldest trolleybus currently being used to carry passengers in Kaunas, sometimes you can see a much older Škoda 9Tr passing by. But it is not taking regular passengers. It is a party trolleybus, with tables, audio equipment and a light show installed inside. Anyone can book it for their personal holiday – the first hour costs 100 euros and all subsequent hours – 50. The driver will take you wherever you want to go with only one limitation – contact lines have to be available. There is also a dancing pole at the back, which, we were told, becomes the centre of the party. Who knows, maybe someday Škoda 14Tr will become a party trolleybus too. The company said that they are going to keep at least one when the rest will be scrapped little by little with the introduction of new machines. We are not sad to see them go, but it is good we got to ride in it now so that we can better appreciate this change. What is this tractor doing? What was its actual original function? What is that black frame around the car windshield? What function does it serve? Nodum.org is a website dedicated to the most interesting news on the internet. Articles about automotive world, science and technology, popular history, interesting videos and many other subjects are published regularly. The biggest emphasis is put on creativity: interesting travelling destinations, hobbies, professions, places where people are not usually allowed to visit and so on. If you are doing something really interesting in your life that you would like to tell everyone about, contact us via our Facebook page, or send us an email to nodum2017@gmail.com.